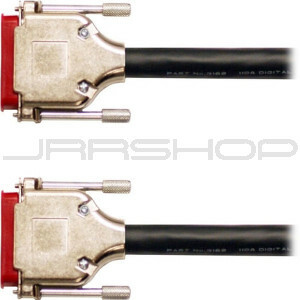 JRRshop.com | Mogami Gold AES DB25 to DB25 Interface Cable - 5ft. This Mogami Gold AES/EBU DB-25 to DB-25 Digital Audio Cable meets AES/EBU specifications with 110 ohm impedance. Its Cellular PP (polypropylene) insulation material results in lower attenuation. The 8-channel I/O design of this cable makes it ideal for use with Apogee, Mackie, Sony, and Yamaha digital recording machines that use the DB-25 connector. DB-25 connectors with gold contacts.